Well, that’s pretty introspective, but it comes from an Emperor speaking from exile and exile tends to encourage introspection. Just ask Newt Gingrich. And now, Tom DeLay is in the Speaker’s hot-seat. The problem for Tom is not a Texas prosecutor or the House Ethics Committee or even the temporary wobbling of his conservative base. The basis is as old as government and used to be called the pay-off. The DeLay incarnation is bold and out there for everyone to see, nothing hidden, the quid pro quo audaciously agreed. If you want political access, it’s for sale. Come get it. DeLay has been working this side of K Street for a decade and the fruits of his efforts have tripled the lobbyists swamping our elected officials to a number somewhere in the mid-thirty-thousands. If you have a scorecard, that’s about fifty lobbyists per Representative or Senator. Tom’s personal contribution to the equation has been to found a virtual employment agency of Republican staffers, associated in various Republican offices for just long enough to learn the rules and then hired-out to lobbyists. Lobbies are told bluntly that their staff had better be Republican and are equally boldly told to ante-up if they expect access. And they get access, it’s no idle boast. That’s how lawyers for the Consumer’s Mortgage Coalition were able to deliver their pre-written legislation to the House of Representatives within three weeks of hurricane Katrina hitting the Gulf coast. Three weeks. Twenty-one days to swindle the American public into creating insurance for those who had none, solely for the benefit of mortgage-holders. Striking while the iron is that hot, carrying ready-written legislation to the legislators within the limited time-span of public sympathy, has never before been possible . Providing that access for campaign support, for money to get re-elected, turns the representative-government equation entirely on its head. We are no longer represented by those we send to Washington. Our Senators and Representatives now reflect the interests of corporate America, first and foremost, through the invited access of their thirty-thousand representatives. Did we notice that happening? Did we care? Do we even care today? I think we do and that’s why I think Tom DeLay will go the way of Newt Gingrich. Not because of some prosecutor in Texas, but because in the past five or six years the percentage of Americans who believe in government has fallen from 40% (which is unacceptable) to a mind-blowing 29%. Less than three out of ten of us believe in our government. That statistic perfectly mirrors public support for the Czech Republic’s post-communist government. Tom DeLay and his warped version of yet another ‘contract with America’ has become a contract to sell off his and your and my heritage to the highest bidder. He will not stand because he cannot stand. 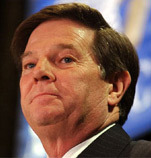 Tom DeLay and reasonably honest representative government in this country are mutually impossible. That is becoming eerily apparent to Republicans and Democrats, as well as an ever-increasing majority of those who see themselves as Independent and vote accordingly. 29% do not a viable government make. More about Conservative Politics at my opinion columns web site.